It’s Menu Monday, it’s almost Thanksgiving and my daughter’s 16th Birthday is tomorrow. Tomorrow you guys!! The fact that I will have a 16 year old tomorrow both completely freaks me out and completely puts a smile on my face. Because for those that know her, you know just how amazing she is. What does any of this have to do with chocolate pie recipes you ask? Given the fact that her Birthday is always around Thanksgiving, she’s come to love pies. Chocolate pie to be exact and she asks for one for her Birthday every year. Do I use the same recipe every year? Nope. I keep trying new ones and every time she says “This is my favorite!” So it’s time to try a new recipe! 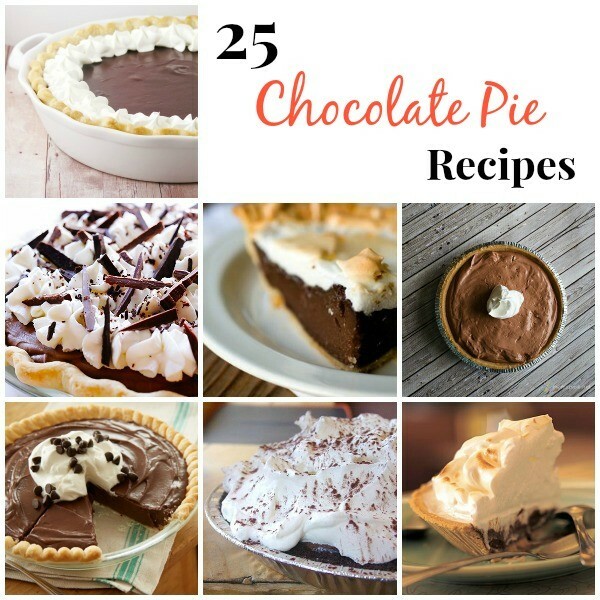 Here are 25 Chocolate Pie Recipes I’ve rounded up. While I decide which one to try, how about you enjoy browsing through them! Which one will I make for her? I still have no idea, but I better decide quick because I’m going to the store today in an attempt to beat the Thanksgiving rush!